The evidence at the site also suggests that more southerly voyages might have taken place, and that other settlements might be found. Archeologists believe L’Anse aux Meadows was a base camp which afforded a way-station to further explorations of North America. Rather like the ISS and even the Mars Rover. Those Vikings from Greenland or Iceland were the demon engineers of the 11th century. Excavations revealed a number of artifacts that are diagnostic of a Viking site. From 1961 until 1968, the Ingstad excavations uncovered Viking artifacts including a ringed pin, a soapstone spindle whorl, a bone pin, a whetstone, iron boat rivets, worked wood and other objects. There was evidence of iron-smelting and forging, and hearth charcoal is dated to A.D. 1000. The style and construction of the three longhouses and outbuildings are identical to 11th century Iceland and Greenland. The artifacts indicated weaving and iron-working, activities which were not practiced by Native Americans until after A.D. 1500. These finds confirm L’Anse aux Meadows as the earliest European settlement yet known in North America. It may have functioned as a kind of garage or shipyard with a dry-dock. Later excavations by Bengt Schoenbak and Birgitta Wallace for Parks Canada revealed more about the purpose of this settlement and the type of activities that took place here. Their work produced further evidence of wood-working and iron-smelting, suggesting that the main activity at the site was repairing damaged vessels or constructing new ones from wood obtained in the nearby forests. Butternuts and worked pieces of butternut wood-a tree that was not native to Newfoundland but was present one thousand years ago in northern Nova Scotia and New Brunswick-were also found. This discovery indicates that the people who lived at L’Anse aux Meadows had traveled further south into the Gulf of St. Lawrence, and had brought back nuts and wood native to those southern areas and were sampling the region’s resources as described in the sagas. These finds suggest that the L’Anse aux Meadows site was a base-camp or gateway to the rich lands around the Gulf of St. Lawrence, which is likely the Vinland of the sagas. The excavations at L’Anse aux Meadows provide a small bit of evidence for these contacts in the form of two artifacts obtained by the Norse from skraelings. One is a beautiful oval soapstone lamp found in the smelting hut. Unlike thick, roughly-made soapstone lamps made by the Norse, this lamp is thin and delicately carved and is an unmistakable product of a Dorset Eskimo carver. How this piece arrived at L’Anse aux Meadows is mysterious, because there were no Dorset people living in Newfoundland at this time. It seems likely that the Norse obtained this lamp by trade or by taking it from an abandoned Dorset site they visited in Labrador. So the Norse were adventurous explorers but clumsy artists while the Dorset Eskimos made delicately-carved artifacts. And it’s something of a puzzle how the Vikings got a Dorset lamp. That’s reminiscent of Otzi the Iceman, who had with him some tools that present a puzzle as to where they came from and how he got them. I’m enthralled by that kind of thing – trade routes and exchanges far in the past that are unknown to us now. Next thing, Erdogan will be telling us the Vikings were Muslims. I’m not sure if you mean that literally, the Norse were master artists, particularly using wood and any longship is an object of beauty. Speaking of trade, there are many examples of artefacts from the Islamic area in Scandinavian archeological sites. The consensus amongst Western historians is that Viking adventurers, “the Rus” sailed down Russia’s great rivers and founded the country’s first state in what’s now the Ukraine, although not surprisingly, Russian scholars don’t agree with the idea of Scandinavian origins for Russia. There’s no doubt that Swedish Vikings settled in Western Russia. There are cultural legacies from the Vikings, for example, Danish had a significant influence on English, however unlike many other ethnic and cultural groups, they assimilated into the local populations relatively quickly and disappeared from history. I am uncertain what is meant by the statement that Native Americans did not weave before 1500. Across wide areas of North America weaving dates back thousands of years. Perhaps they intended to say ether local natives did not weave or natives did not use spindle whorls. The name “Greenland” is a bit of hucksterism by Eric the Red (father of Lief Ericson). Even though Eric knew the place was mainly covered with ice, he advertised it as Greenland to get the gullible to settle on land Eric owned there. RJW – I didn’t mean anything sweeping. I just found it interesting that Norse lamps were thick and roughly made while Dorset Eskimo ones were delicate. Then again L’Anse aux Meadows was apparently just a shipyard and transfer point, so thick rough lamps were probably like camping gear. I wasn’t casting aspersions on the Norse though. I’ve always enjoyed history. Stuff like this I find pretty fascinating. Enjoying these posts on the Norse explorations. I’m enthralled by that kind of thing – trade routes and exchanges far in the past that are unknown to us now. Other evidence… is purposely shaped skulls on individuals buried in cemeteries in parts of eastern Europe, and in some instances further westward. Characteristic are long, roughly conical shapes coming to almost a rounded point at the top. The practice of binding a baby’s head with tight bands of cloth to cause to skull to assume an elongated shape was common among some peoples who lived north of the Black Sea. During the fifth and sixth centuries, such skulls are represented in cemeteries in several regions of Europe. In some cemeteries in the Carpathian basin, the majority of individuals buried in the graves had artificially shaped heads, as for example at Mözs, in southwestern Hungary, and at Gaweinstal, in lower Austria. We do not know whether the individuals in these graves were themselves immigrants from the east, or descendents of immigrants from the east, or possibly even local persons whose parents, for whatever reason, adopted this practice of head alteration. Situated on an island in Lake Mälaren, in central Sweden, just west of the modern city of Stockholm, Helgö was established as a major center of manufacturing and trade around A.D.400. … The extent of the trade networks of which the community at Helgö was a part is evident in the recovery there of a bronze figure of Buddha from northern India and an ornate bishops’s crozier from Ireland. A hoard of 2,211 silver coins found at Ralswick [a port on the island of Rügen in the Baltic Sea, off the northeastern coast of Germany] brings home the extraordinary wealth and the long-distance interactions in which the community was engaged. The hoard was buried sometime in the first half of the ninth century, and the coins in it were mostly from central Asia and the Middle East. It’s the one against the red background. There are other images from the site, but a paucity of captioning. In short, the Viking lamp: http://www.lesfilsdodin.com/images/ansemeadowslamp7339ry9.jpg – common among the Norse, unknown to the Native Americans. 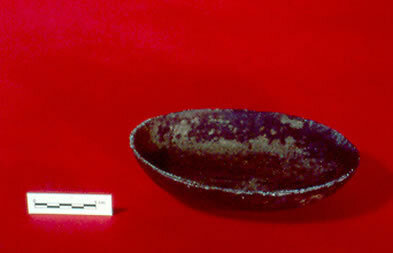 That site starts off at L’Anse aux Meadows and quickly blossoms into a study of artefacts from the Americas as a whole. Imagine – carvings of bearded men created by people whose men did not grow beards! It MUST be the vikings!! Some may enjoy Runic Records of the Norsemen in America, O. G. Landsverk, Erik J. Friis Pub., 1974, ISBN 0-8057-5457-1. Among the items of interest is a stone carved with Norse runes found at Popham Beach, Maine; I have seen & photographed this stone. Addendum: Popham is a quite logical site for stopping off, establishing advance camps, etc. A short ways inland there is arable land and the surrounding bays & inlets would provide ample fishing/crabbing/lobstering.